As many of you know, I’m really into creating basic patterns that are easy to make. With that in mind, I set out to create some crocheted fingerless gloves. I love to work in the round, without joining or seams if possible. So here is my basic and very simple crocheted fingerless glove project. After making this basic crocheted pair of fingerless gloves, I decided that I would try adding a bit of a thumb to it. Below is the pair of gloves that I crocheted with the optional thumb. The second pair of gloves were crocheted just a bit smaller by only doing 40 rows of ribbing and 40 stitches along the edge for the body of the glove. This resulted in a 1/4 inch smaller cuff and finger opening area. I mention this as a way to show that this pattern can be adjusted for smaller hands by just reducing the number of stitches on the ribbing. Likewise, you could make larger gloves by just increasing the number of stitches of the ribbing when you begin the pattern. Each pair of gloves use just one skein of yarn and do work up very quickly. As always, I hope you enjoy my free pattern and happy crocheting to all! Measurements: 8-3/4 inches long, 3-1/2 inches wide at cuff & 4 inches across at palm. Using F hook for ribbing, leave a long tail and ch 15. Ch 1, turn. Working in BLO, Sc in ea st across. Length is approx. 6-1/4 inches long. Leave yarn attached and just slip hook out of last st so you can weave closed the cuff. Using the long tail from the beginning row, weave closed the cuff by joining row 1 to row 42. Slip the F hook back into last st of row 42. Now working into both loops, Sc evenly along end sts of cuff. (Approx. 41 Sc) Don’t join at end of round but just continue working in the round without joining or turning as you work the body of the glove. Using G hook now, Sc in ea st of rnd. Ch 10, sk 8 sts, and Sc in ea st around back to the chain for the thumb. Sc around the chain for the thumb evenly (approx 12 sts) and Sc in ea remaining st of rnd. Sc in ea st. On final rnd, end with Sc in ea st until the last 3 sts. Work Sl St in the last 3 sts and use tail to weave under to end with a smooth edge. Tip: I worked the last several rounds very tightly so the finger opening was snugger on my gloves. Attach yarn at right hand side of V corner of the thumb opening. Using the G hook, Sc evenly around the thumb opening. Don’t join or turn. Work 1 Sc dec over the 2 sts at the V corner of the thumb opening on both sides. (2 dec’s on rnd) Check the fit of thumb to make sure it fits and adjust the dec’s as needed. Sc in ea st and end final rnd with a Sl St. Awesome .. I have some Red Heart “heart & sole” yarn in my stash .. this would be perfect .. and could make some great gifts for Christmas! Thanks for sharing! It’s been years since the last time I crocheted. I want to try it again, hope I can make one as beautiful as this. 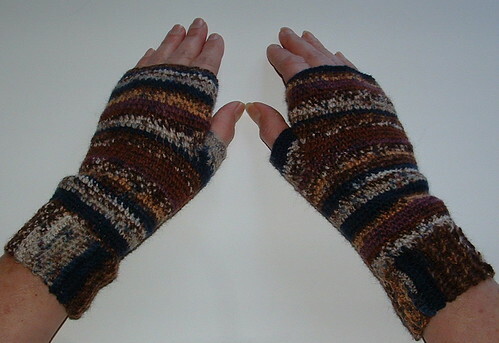 love these…i did make a bit of alterations for my skinnier than average hands…first i started with a few less ribbing rows, then i increased a stitch every other row up to the thumb, then decreased 2 stitches every row after. i also added a shell edging around top, bottom, and even the thumb. only took one tiny skein of sock weight ‘magic stripe’ yarn! Looking forward to trying to make these for my grand daughter. 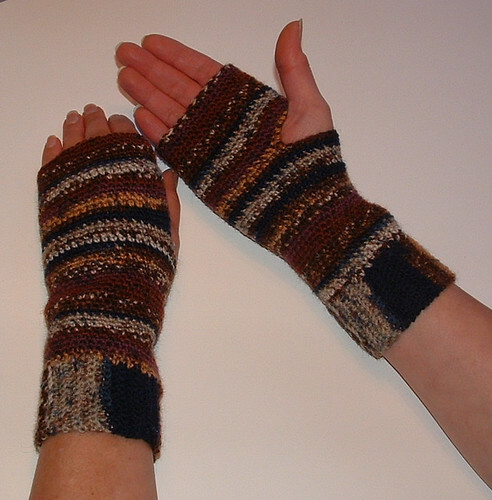 Carol – I few people have said that the beginning stitch count should be decreased for more snug fitting glove cuffs. I would suggest doing that for smaller hands or younger girls. Then you could increase a stitch or two if needed as you work the body of the gloves. Best wishes and let me know if you have any questions as you work the project. Just wondering if you had made these in regular 4 ply yarn, and if so did you make any changes in number of stitches or hook size? Cheryl — I haven’t tried this pattern in another type of yarn yet. Do you have smaller hands or larger? Let me know and I will try and help you further. I just sent you an email too. 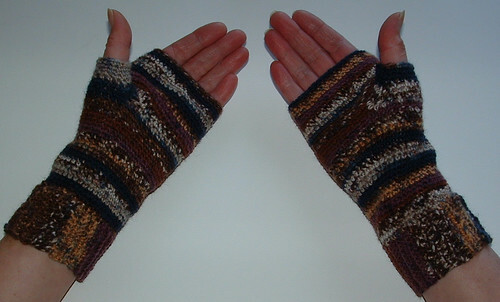 I’ve been looking for an easy fingerless glove to make, partly for my tendonitis and partly for wearing under mittens. I’m going to try these. I made mine with Caron Simply Soft yarn; used one skein with yarn leftover. I adjusted them for my hand size & included the partial thumb. I used grey to be more neutral and they fit nicely. I also did my cuff differently because i couldn’t understand the directions or figure it from the picture, but it still worked out. thanks again! I just finished making a pair for my 13-year-old daughter, and she likes them a lot. Thank you for this pattern. I was apprehensive at first, since I usually only crochet afghans, but the pattern is quick and easy. I’m gonna try to make me this set (but changing the color, I look horrible in red). I was going to post this on FB, but I read that I can’t. Oh well. hey so this is an awesome pattern for basic construction and like a few other people here, i embellished as i went along… i have tiny wrists like 4 inches around, but a small to medium size palm and longish fingers, yes sounds strange, but let’s say i’m slim lol, so being able to tailor patterns is something i’m good at, but yours makes this extremely easy to do… i used a chunky weight very soft alpaca in natural white, and added in half fingers as well. also in addition to doing rows tighter at the top, i decreased about 4 sc evenly. and instead of weaving the cuff closed, i stitched in some pearl white buttons i had… it is very pretty, but thank you so much for the platform off which to create!